India sits on an opportune moment in history, with a demographic dividend of 65% of her human resource pool under the age of 35 with about 12 million individuals expected to join the workforce every year. With the demographic dividend, comes the responsibility of equipping the youth with employable training and inturn, employment. With India metamorphosing into one of the fastest growing economies, job creation and skilling seem to be natural tools to ensure sustainable growth. The system has, however, been plagued with theories of demand supply mismatch and the absence of credible data. 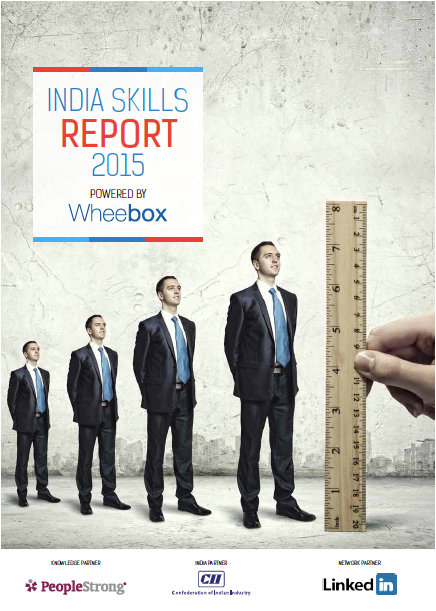 Wheebox in collaboration with India Partner "Confederation of Indian Industry", Knowledge Partner "PeopleStrong" and World's largest professional network "LinkedIn" realised this to bring out the India Skills Report which is a conscious, one-of-a-kind effort to provide an insight into the hiring trends of the market while understanding the needs of the job seeker and organisations. The second edition of the report has reached out to about 3,00,000 students across 29 states and 7 union territories from the supply side and corporate players from 10 diverse industry sectors on the demand side. India Skills Report successfully brings Government, Industry, Sector Skill Council, Associations and Academia on one platform and bringing in a thinking tool that can be used by different stakeholders to come with a solution for the skills issues of the country. Media : Click here to contact Corporate Communications.